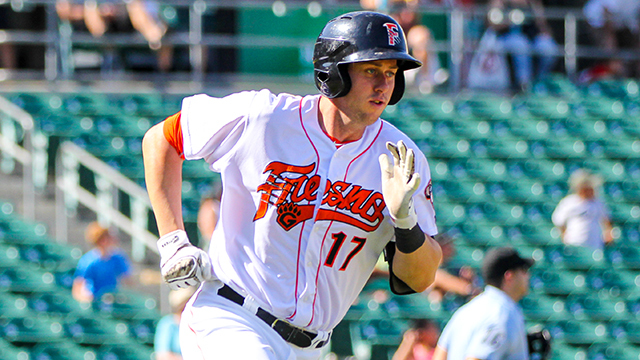 ROUND ROCK, Texas - Fresno Grizzlies third baseman Matt Duffy has been named the 2015 Pacific Coast League Most Valuable Player, the league announced today. Duffy received more than half of the votes from the 16 field managers, as well as media representatives from across the league to be named the 79th PCL MVP in league history. He becomes the second Fresno player to ever receive the PCL's highest honor, joining Calvin Murray who was MVP in 1999. The 26-year-old has been the top run producer in the PCL this season with a league-high 102 RBI and 90 runs scored. His RBI total is six away from tying Fresno's club record, and he is just the third PCL player to reach the century mark for RBI since 2012. Duffy also leads the Grizzlies with 141 hits, 29 doubles, and 228 total bases in a team-high 124 games played. He ranks second on Fresno's roster in home runs (18) and batting average (.295). On Monday, Duffy was selected by the league as the third baseman on the All-PCL Team. The native of Boston, Massachusetts, recorded the first five-hit game of his career on April 15 compiling four singles and one double against Salt Lake. Duffy hit an inside-the-park home run vs. El Paso on July 16 at Chukchansi Park, and is one of just seven players in the league to accomplish that feat this season. Three days later he began a 15-game hit streak that would last through Aug. 3, tying his career-high. Duffy's special season has helped the Grizzlies win the Pacific Northern Division title and clinch the club's first postseason berth since 1998. The Houston Astros originally selected Duffy in the 20th round of the 2011 First-Year Player Draft out of the University of Tennessee. The 2015 season is his second at the Triple-A level, having played last season with former Astros' affiliate the Oklahoma City RedHawks. Among the others to receive votes for the Most Valuable Player award were Jamie Romak (Reno), Jesus Montero (Tacoma), and Domingo Santana (Colorado Springs/Fresno). Below is the PCL's remaining schedule for the end of the season awards.